Become the best run and gun competitor you can be. If you’re attending the May 18/19 Lone Star Armory Run and Gun, get half off on the workshop. This Run & Gun Workshop is a derivative of the Competition 2 Gun Class, however, it is modified specifically for Run and Gun competitions. In this Run and Gun class, we will go over techniques for how to be fast and accurate with your handgun and rifle, fluidly (and safely) moving around a stage, transitioning quickly between targets, stage strategies, and more. If you want to get the competitive edge in your next run and gun, this is the class for you. This is an all day, 8 hour class. What is a Run and Gun? Run and guns are unique competition formats that involve a multiple mile run course, usually around five miles, and a number of shooting stages along the way with rifle and pistol. Run and Gun competitions combine physical fitness and shooting proficiency in a unique way in the competition world. 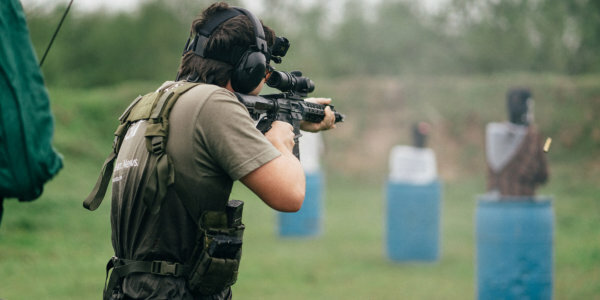 Run and guns aren’t about “bullseye” target shooting shooting, run and guns are all about balancing speed and accuracy in a practical and dynamic environment. Run and gun competitors must be able to quickly move through stages, taking difficult and awkward shots from close to far distances. This requires a proper understanding of acceptable sight pictures, improvised shooting positions, moving with a rifle or pistol, and more. If you examine your stage time, where are the biggest gaps in time? Where is the most time that can be shaved off? Is it taking a 0.25 split down to a 0.2 split? Or is it taking 2 seconds instead of 5 seconds to move between a shooting position? Movement is one of the greatest opportunities to shave off time on a shooting stage, so we’ll spend time getting you to move quickly around a stage with a rifle and pistol. 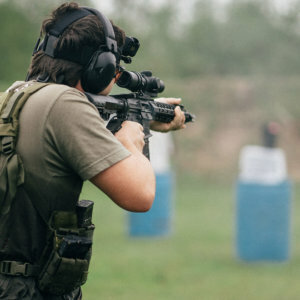 When shooting with a rifle, particularly at longer distances for a carbine, the key is to get into a stable shooting position as quickly as possible. 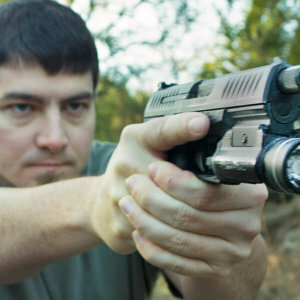 We’ll go over getting stable shooting positions and how to get in and out of them quickly. This class custom tailored for Run and Gun competitors, but is applicable for anyone looking to get better with their rifle and pistol, be it for 2 gun competitions or personal protection. This is not a class for brand new shooters. This class requires basic understandings of how to manipulate and shoot both rifle and pistol. Run and Gun experience is not required, but will help maximize the learning experience from the class. Gear is available for rent upon request, but it recommended that you use whatever gear you normally compete in run and guns with. Participants will be required to sign a waiver, minors will require a parent or guardian there. Final payment: The full payment can be completed at any time, but will be due before the class begins. That can be paid electronically before or at the class itself. Cancellation policy: Deposits will be refunded up until one month before the class. Deposits will not be refunded within one month leading up to the event unless there is a waitlist and someone else can take the spot.